This week, as part of “Limited Time Magic,” I turn on the holiday spotlight as we celebrate Christmas in July! With temperatures hovering in the 90s this week, I long for the cool embrace of winter. I figured it was a perfect time to check in with the seasonal team. Around this time last year, we introduced a series of collectible resin ear hat ornaments that were incredibly popular with guests. I’m excited to share that brand new ornaments are being introduced this month. 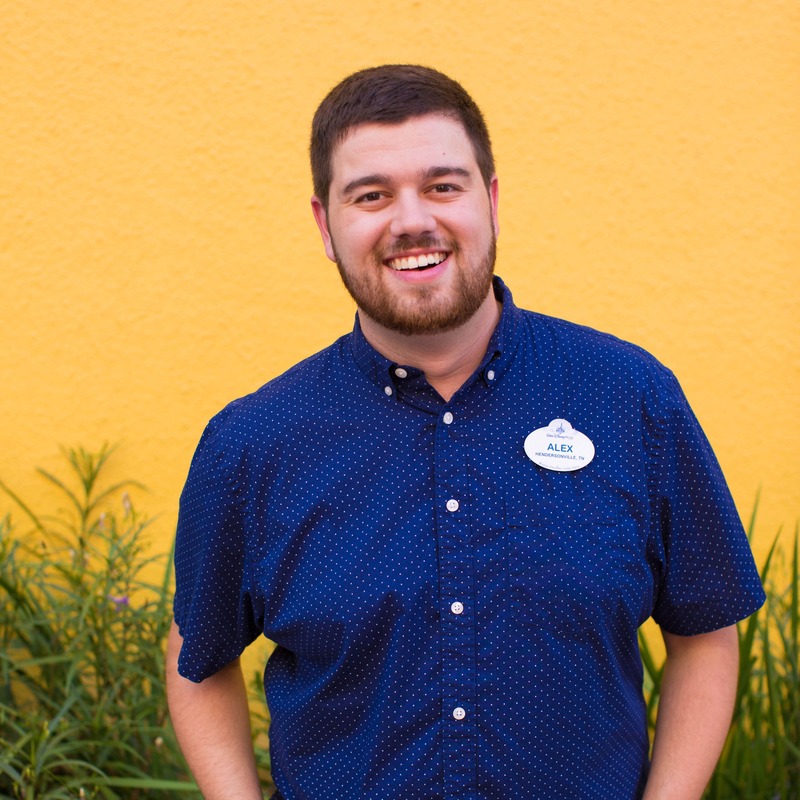 I spoke with Cody Reynolds, creative manager with Disney Design Group, about what we can expect. Artist Derrick Lirette contributed several designs including many of the attraction ornaments like Space Mountain, Big Thunder Mountain and more. He also created the ornament inspired by Santa Mickey just in time for “Limited Time Magic” this week! Look for these ornaments and other festive holiday décor starting July 21. At the Disneyland Resort in California, I invite you to visit China Closet in Disneyland park, Trolley Treats in Disney California Adventure park, and World of Disney Store in the Downtown Disney District. At Walt Disney World Resort in Florida, you will want to visit Ye Old Christmas Shop in Magic Kingdom Park and Disney Days of Christmas in Downtown Disney Marketplace. You can also find select ornaments on our Disney Parks online store by visiting DisneyStore.com/Holidays. Which ear hat ornament is your favorite? 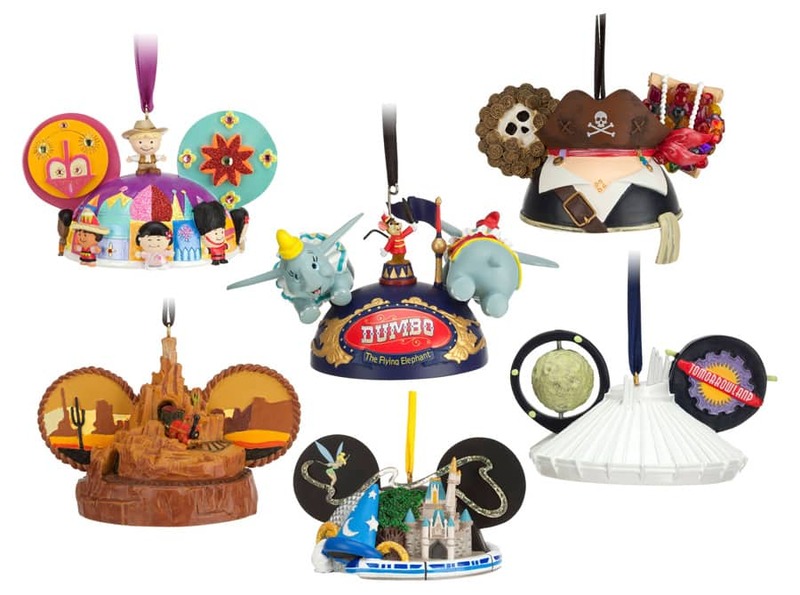 Do you know if they are re-releasing the 4parks 1world ear hat ornament? I don’t know Stephanie, they’re sold out at Disneyland. Snow White set is available, though. 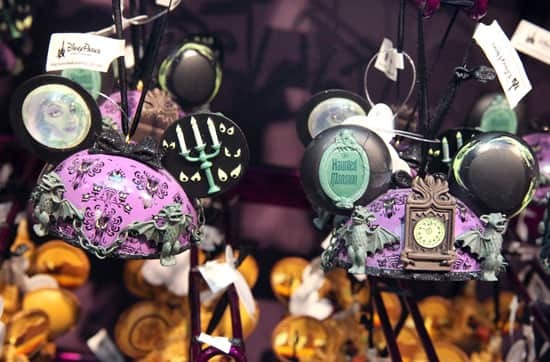 Any update on the release date for the Electric Parade ear hat ornaments? It was announced for August but the month is already half over! Hi @STEVEN: on the web shop I found an Aladdin earhat ornament. Would that one also gonna be available at the parks (Disneyland preferably)? 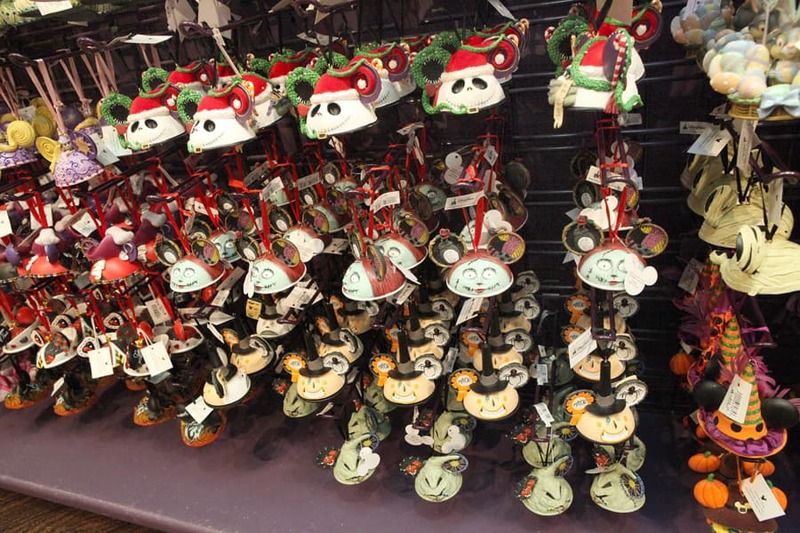 I haven’t seen development for a Duffy the Disney Bear ear hat ornament. Closest thing might be the Vinylmation figures that were released awhile ago. These are amazing. 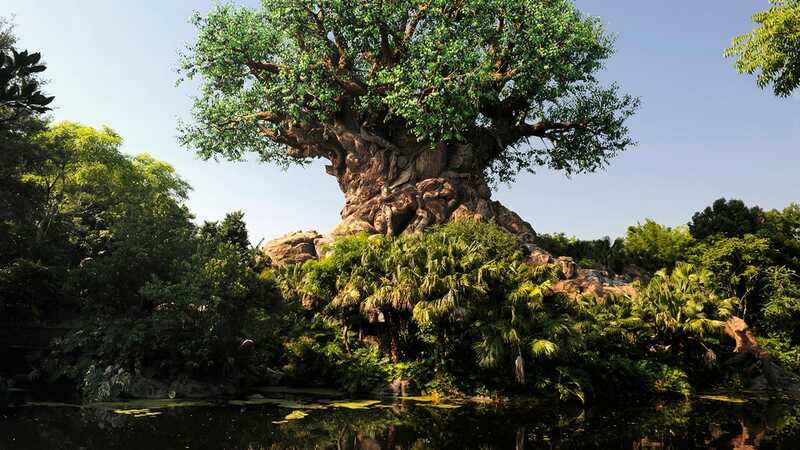 I am going to be in Disney World on Aug 28th do you think the Tigger and the Mickey will be available then. these are definite must haves for me the Mickey and my best friend the Tigger lover. Any Donald’s in the forecast, he is such an under recognized character when it comes to merchandise. @Donna – The availability will depend upon popularity of the ornaments. In theory, they should be in stock at that time. We introduced a Donald Duck ornament last year. The item number is 400006477507 and it is still available. Steven, I WANT THOSE!!!! 😀 Will these be sold on DisneyShopping or will this only be available in the parks? Could I purchase the set by calling WDW Merchandising? I must have these and I will not be back to Disney until December; with only 600, I don’t expect them to still be available. Unfortunately, I don’t have a firm release date at this point. Once I hear one, I will advise. I’ve got all the ear hats now, I looove the new ride hats. Small World & Haunted Mansion are fabulous. I really like the attraction ornaments. I bought 6 of them for my wife last week. 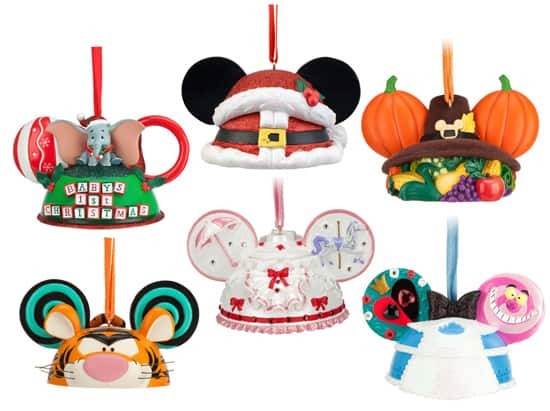 Is there any plans to release any other ear hat ornaments this year (not the Spectromagic set)? I was hoping we would see more of the main characters and perhaps even Merida. (I haven’t seen any Brave ornaments in the park). Also, is the Santa Mickey a limited edition? Most of them this year were not, unlike last year were most of them were. There are no other ear hat ornaments planned for this year. Yet I believe the team is already considering ornaments for next year! The Santa Mickey ornament is not limited edition. I’m sure my parents will have a great time! My mom has been going to Disneyland since 1955! I completed my quest to ride all five it’s a small worlds in 2010, when I visited every Disney Park around the world in one year. Steven, I do have a question for you – I saw the Aurora ornament on disneystore. The only one I saw looked just like last year’s ornament. My mother-in-law said she saw one and it was different than last year’s ornament. Was there a different style released for 2013 or is there only the 1 style that we saw last year? I don’t know of any plans at this point to update the previously released Disney Princess ornaments. Steven I am in Heaven!! I have already added 7 of these new Ear Hat Ornaments to my collection plus all 19 of the Shoe Ornaments! The good thing was that disneystore released a coupon code this past weekend for 25% off so I racked up. I can’t wait for that delivery. Disney + Christmas = Winter Magic!! I’m going to get Space Mountain for my parents, who are visiting Disneyland Paris in August to complete their quest of riding every Space Mountain around the world! @George – Now that’s an awesome story! I would totally love to do something like that. I’ve only been on three of the five mountains. I hope they have a wonderful trip! I am at Disney World right now and went to both of the Christmas stores and neither carried the 4 Parks Disney Ear ornament is there any time table for when that one will be in stock or released? We would love to pick it up when we are here as they have the special going right now in the stores. @Andrew – I’m sorry for any challenge. 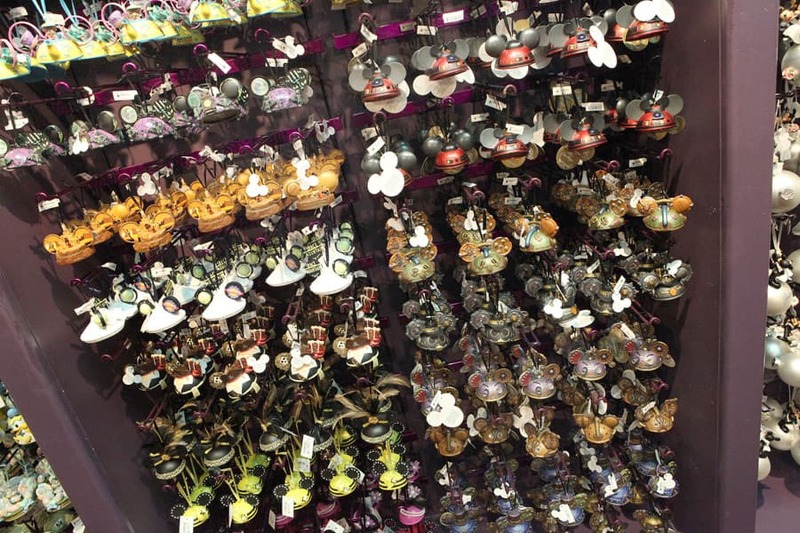 It appears that ornament may be temporarily out of stock at Disney Park locations. I was advised that additional ear hat ornament orders are due to arrive in mid-August. Meanwhile, you can find that ornament on the Disney Parks online store. They are currently offering a similar promotion for ear hats online too. Does the Disney’s Days of Christmas store have the It’s A Small World ornament in stock? @Cynthia – As of this morning, the “it’s a small world” ornament is being carried in multiple locations including Disney’s Days of Christmas at Downtown Disney Marketplace. You can also find the hat in locations like It’s a Wonderful Shop at Disney’s Hollywood Studios or Ye Olde Christmas Shoppe at Magic Kingdom. Try looking on Ebay for the Haunted Mansion ear hats. I have seen several of them but I am not interested in Haunted Mansion ones, even though they are very cute!! I have seen them also on the Disney Parks online store. I’ve noticed I tend to read about new Disney items that will be coming to the Disney parks but I won’t be going to Disneyland until September. So I’m afraid I might miss out on something, so I check the Disney Parks online store and/or Ebay and I’m usually able to find the new items. Sometimes not right at first or there’s only a few items, but I keep checking back and can usually find them. Good luck, hope you’re able to find the ones you want!!! You mentioned that you were looking for the Little Mermaid ear hat but the Disney Store online didn’t have it either. I was just looking at the ear hats from the Disney Store online and I saw the Little Mermaid ear hat. I don’t know if it’s different then what you’re looking for but I saw it and it was available. Hope you’re able to find it, I’m sure your daughters will love them! Hope they get some more. @Michael – The plan is to carry them for awhile with additional orders arriving in the coming months. I believe the Haunted Mansion one is currently unavailable on the Disney Parks online store. Yet I know they select Disney Park locations had some. That particular ornament isn’t limited edition so you will see additional ones available in the future. @Janis – I’m sorry to hear of your challenge. The inventory on the Disney Parks online store changes often based on demand. I know that locations at Disney Parks still carry the Ariel ear hat ornament. Your best option would be to contact our Merchandise Guest Services team. You can reach them by telephone at 877-560-6477 or by email at Merchandise.Guest.Services@DisneyParks.com. When calling, please reference this item number – 400006477613. I hope your daughters have a wonderful birthday. And I hope all is well in Arizona. I’ve been to many parts of your state (Sedona, Tucson, Phoenix) and it’s beautiful! Hi Steve, can I find the electrical parade ornament hats at the same locations you listed beginning on July 21st as well? @Debbie – Yes. We knew you were going to Disneyland 🙂 I’m happy to hear you will be visiting, and I hope you have a wonderful time! Enjoy a Dole Whip in the Enchanted Tiki Garden for me. BTW, we display ours year-round by hanging them from tiny hooks on our wall shelves we display our Vinylmations on. It’s fun not to stuff them away only to see a few months a year. But they do sit flat too for those that want to display w/o hanging. PHENOMENAL job this year!!! We bought more than half of them last year and it looks lie we’ll want an even bigger percentage of this year’s offerings! GREAT GREAT JOB!!!!! @Jennifer – Yes! They can be displayed all year long. There are only few exceptions that I can think of which aren’t flat along the bottom (Lady & the Tramp and Pirates of the Caribbean). OMG these hats are all sooooo cute!!!! Would love to have them all! I love the details that have gone into these ornaments. Will there be a Disneyland hat as well??? 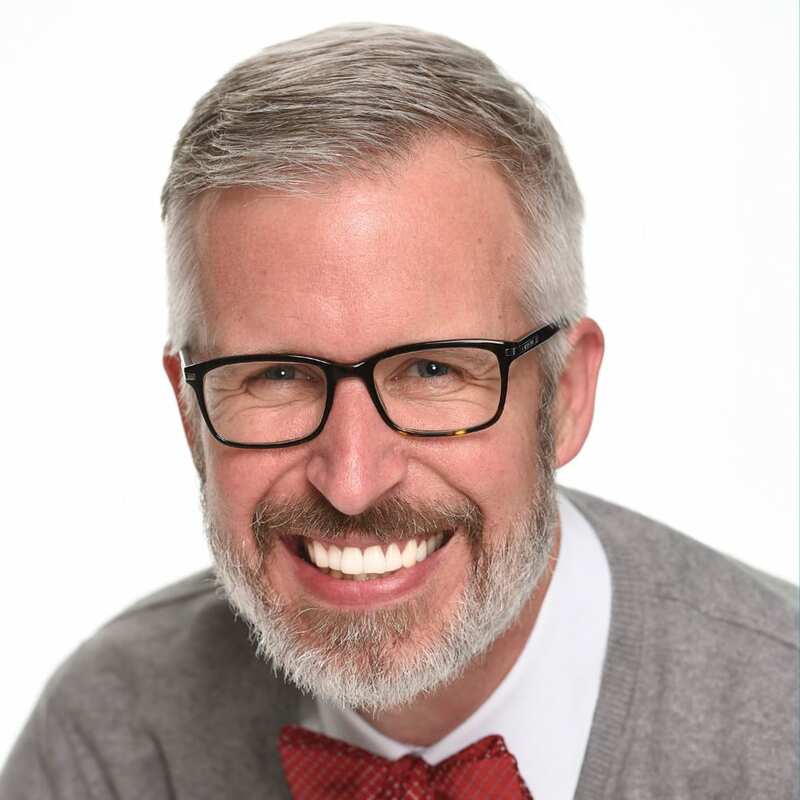 @Coleen – I spoke with the seasonal team. While there currently isn’t one in the works, it is something they are considering for future development. I’m a little confused…these are limited time magic, and won’t be coming out until Sunday? But…I saw a bunch of these at the Christmas store in Magic Kingdom on the 6th! I remember, because I was particularly enamoured with the Space Mountain one, and tried to see if the moon was glow-in-the-dark. Am I missing something? @Elizabeth – Yes, you did see them … at least almost all of them. The newest ornament will be the Santa Mickey one shown above. That one is due for release starting July 21. It will also be offered online starting July 22. @Carmen – I hope you have a wonderful trip! The ornaments will continue to be sold during the next few months. Since it’s “Christmas in July,” I wanted to spotlight these ornaments. So you should be able to find several at the locations listed above during your visit. These are fantastic! Do they have any of last years designs still available? Particularly the Reindeer Pluto and the Mickey Christmas scene with snowflake ears, a christmas tree, presents, and Mickey’s head peeking out? These are two I should have purchased! @Nicolette – There may be some select ornaments still available at the locations listed above. At least I saw some previously released ornaments there during a recent visit. As for the two specific ornaments you seek, I don’t believe either are available now. When I checked our merchandising system, it didn’t appear to have any inventory listed. Sorry that I don’t have better news. I love the Thanksgiving one. I am also happy to see a nod to Mary Poppins! Oh man…I foresee a new “must-have” collection as well as a hit to my bank account!! haha These are great! Too bad those dont come in sizes you could wear.